If You're Gone by Brittany Goodwin. Publication: June 20th 2016 by Edge of 22 Publishing. 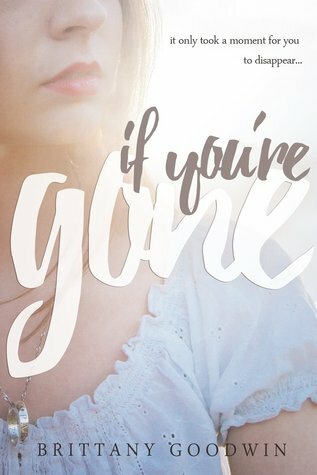 If You’re Gone traces a trying summer for rising high school senior Lillian White as she struggles to cope with the sudden disappearance of her boyfriend, Brad Lee - reported missing the morning after his graduation ceremony. When law enforcement dismisses the case and classifies Brad as voluntarily missing, Lillian becomes desperate to prove that he couldn’t have just walked away. Not from his friends. Not from his family. Not from her. Launching her own investigation into the darker side of her small North Carolina town, Lillian begins to uncover secrets from Brad’s past that force her to question everything she thought she knew about him and their relationship. If You're Gone will be available June 20th, 2016 from Edge of 22 Publishing. My background is in film and one of my favorite parts of the filmmaking process is working with the composer to create the perfect soundtrack for the movie! I picture each chapter from If You’re Gone like a scene from a movie, and I’ve created a playlist (in book order) for many of my favorite moments in the book. 1) A Thousand Years by Christina Perri- “How can I love when I’m afraid to fall?” The ultimate sappy love song, I can hear this tune playing during Lillian and Brad’s date at the lake. There is some foreshadowing in the lyrics too, which makes it 100% perfect! 2) Anywhere But Here by Safety Suit- When Brad leaves Lillian at her window, clinging to those three little words, this song would be playing as she watches him walk away. She doesn’t yet know how her life will change after that moment, and the lyrics “I wonder if maybe, maybe I could be all you ever dreamed” are just so beautiful but haunting. 5) Rescued by Jack’s Mannequin- Lillian spends a lot of time in her room, often in her bed, thinking about Brad and trying to cope. “I’m finally numb so please don’t get me rescued".” This song would be on repeat on her iPod, along with the other two Jack’s Mannequin albums. 6) Watch Over You by Alter Bridge- “Blue skies turning grey, like my love” This song could easily play several times throughout the book, but the moment when Chris leaves Lillian at the lake I can hear the guitar starting to strum. The lyrics sound like they were written for this book- and the song can be sung from Lillian or Brad’s perspective. 7) Tell Your Heart to Beat Again by Danny Gokey- I can’t listen to this song without becoming overwhelmed with emotions. “Yesterday’s a closing door, you don’t live there anymore” is an important lyric and this song would help Lillian as she tries to re-claim her life. 8) The Sun is Rising by Britt Nicole- “You’re gonna make it, you’re gonna make it.” This track is absolutely playing when Lillian returns to Grissom lake with her friends to celebrate Brad. “The future you had hoped for is now burning, and the dreams you held so tight have lost their meaning”. 9) This is Not the Last Time by David Cook- (have a mentioned that I LOVE David Cook?) As Lillian walks home from Anna’s, she is re-energized. The lyrics “This is not a goodbye, this is just a lullaby” give her strength. 10) September by Daughtry- “Reflecting now on how things could’ve been, it was worth it in the end.” As Lillian drives Anna’s car in one of the final chapters, this track guides her home. 12) Never Gone by Colton Dixon- And… cut to black! Finish the book, let the credits roll in your mind, and listen to this awesome rock ballad. “With you all along, no I was never gone” speaks to Lillian’s faith as well as her relationship with Brad. He didn’ t come home last night. My heart pounded as I replayed the message a second time. After waking up to my buzzing phone signaling four missed calls and a voicemail marked urgent, I expected to hear juicy gossip from Jason Hamilton’ s graduation party. Instead, I learned that my boyfriend was nowhere to be found. “Brad said the two of you had plans after the ceremony, was he headed somewhere after he dropped you off at home? I know it’ s early, but call me back as soon as you get this.”“He isn’ t with me,” I assured Brad’ s mom when I returned her calls. “But please let me know when you hear from him.”“I will,” Mrs. Lee promised before hanging up. “And you do the same.”She wasn’ t as frantic as her message had let on, but there was an unsettling tone in her voice. We both knew it wasn’ t typical of Brad to stay out all night without telling anyone. “I’ m sure I can scrounge something up.”“You owe me,” she laughed. “I know. Bye.” I pressed end and clutched the warm phone in my hand as I attempted to sort through my thoughts, reliving every detail from the previous night. The ceremony. The picnic. The lake. The window. Brittany Goodwin is an author, screenwriter and director, best known for the internationally distributed faith-based feature films, Secrets in the Snow and Secrets in the Fall, which have both been awarded the highest honor of five Doves from the Dove Foundation. Brittany lives outside Nashville, TN with her husband and every growing number of rescue pets. She enjoys traveling with her husband and dogs, DIY projects, quoting John Hughes films, playing (and winning!) movie trivia games, and binge-watching Investigation Discovery Channel. 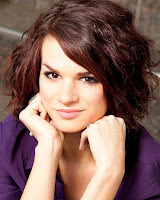 A self-proclaimed armchair detective, Brittany is an active member of many Missing Persons blogs and Facebook pages, which inspired the topic of her debut YA novel, If You're Gone. Sounds like a great read can't wait to get this book. I can't wait to read this book. Gotta add it to my TBR.